Marc Jacobs is a household name for anybody interested in fashion, so what better gift to get for the fashion enthusiast in your life than something from Marc Jacobs. But not just ANYTHING, many Marc Jacobs items are expensive and hard to come by, that is why solifestyle suggests MJ's Special Items. From bags to boots to books at price-points from as low as $4 (shoe laces) to as high as $1700 (surfboard) all of these items are emblazoned with the Marc Jacobs logo and are sure to make somebody special very happy. Buying information after the jump. Marc Jacobs Special Items were once consolidated at the Marc by Marc Jacobs Accessories Store in NYC's West Village- an extremely crowded and stressful store. But that store has since been eliminated and the special items were moved to 4 separate stores- Marc by Marc Jacobs Men/Men's Accessories, Marc by Marc Jacobs Women and Bookmarc all within a 5 minute walk of each other and still in the West Village. Some of solifestyle's favorite items are the City Tees, Sharpie markers, shoe laces and notebooks. Something to keep in mind is that these items change regularly and often sell out, so don't get your hope too high about anything in particular but there are so many different items to look at and choose from that there is definitely something for everybody on your gift list. 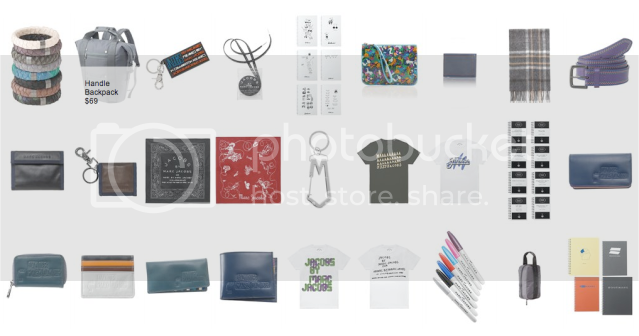 and special very small selections of the items are also available online here.